Standard equipped with the angle-bar fixed table, FR series is ideal for the pouch filling operations of heavy duty packaging from 4 to 33Lbs at rice polishing factories or rice shops, and also for packaging animal food, fertilizer, or miscellaneous cereals. 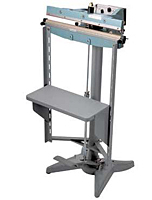 With its effortless foot-pedal operation, you can achieve beautiful and strong sealing without any difficulity. The sealing pressure may be adjusted according to bag thickness and material. Adjust the pressure by turning the pressure adjuster nut located at the center of the pressure lever. Models for seal widths of 2,5 and 10mm(0.07″, 0.19″, 0.39″) are available. In addition to a single side heating type capable of sealing materials up to 0.3mm/ 11.8mil thick(total thickness of overlapping shieets), there is a double heating type capable of sealing thick or laminated bags up to 0.4mm/ 1.57mil thick. Optional hot stamp printer and clamping retaining device, PK-101, are availabe on request. Package films can be sealed easily just by depressing the foot-pedal. Sealing pressure can be adjusted for optimum sealing. Optional hot stamp printer, FEP-N1 series can be installed on request. Clamping retaining device PK-101 also available.